For over twenty years, Jim Curtis has battled a mysterious chronic illness. He grew accustomed to living in pain, denial, and despair. But when traditional medical therapies didn't help, he sought answers elsewhere. He traveled the world and met a group of extraordinary people he calls The Stimulati-and what he learned from them ultimately changed his life. In The Stimulati Experience, Jim outlines his own incredible journey, as well as his step-by-step program to overcome pain, setback, and struggle to transform your life into one filled with better health, freedom, joy, strength, and purpose. Whether you suffer from a chronic illness, anxiety, or depression, you'll learn how to achieve better health and an abundance of happiness. 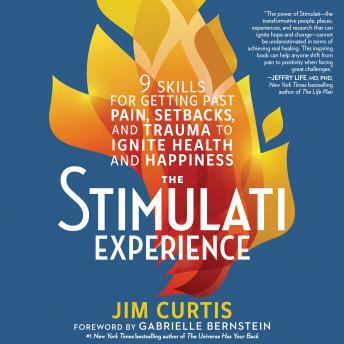 Featuring a motivational and inspiring foreword by New York Times bestselling author Gabrielle Bernstein, The Stimulati Experience distills Jim's unique nine-step program created from his own personal experience, The Stimulati themselves, and lessons he has learned from creating the world's leading digital health platforms.